Deniers are really upset that climate scientists are aware that humans are causing global warming. It's not something magical or difficult to figure out. By our actions of burning fossil fuel, deforestation etc, we have added an additional 40% or more of CO2 to the atmosphere. About half of what we've emitted has gone into the oceans. If it hadn't we'd have almost doubled the CO2 in the atmosphere since the beginning of the industrial revolution. The fact it has is causing the oceans to get more acidic. So we're not only causing global warming we're causing acidification of the oceans. Yet deniers like Anthony Watts tell lies about a recent study that demonstrated that scientists are aware of this fact. Now a chap called Brandon Shollenberger is also trying to make out that a recent survey is misleading. But it's Brandon who is the one who's misleading. It's quite simple. Researchers examined the abstracts of around 12,000 scientific papers on the topic of climate change and global warming. 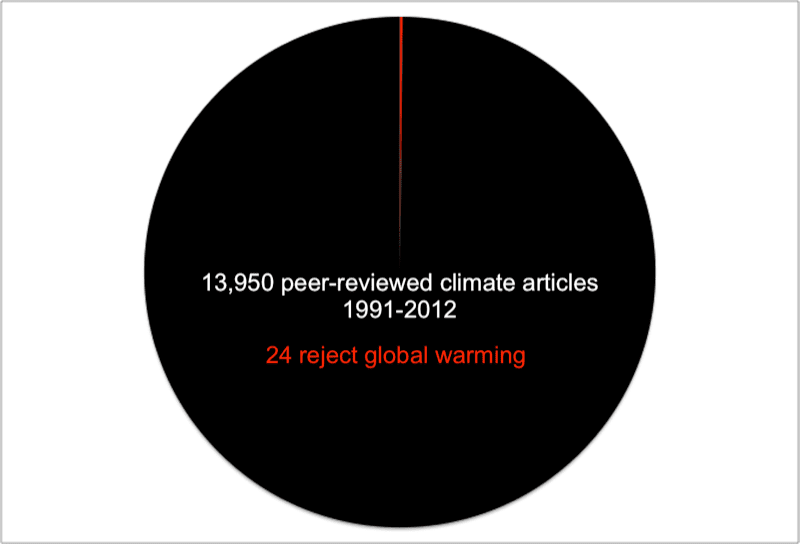 Of those abstracts, around 4,000 attributed a cause to global warming. 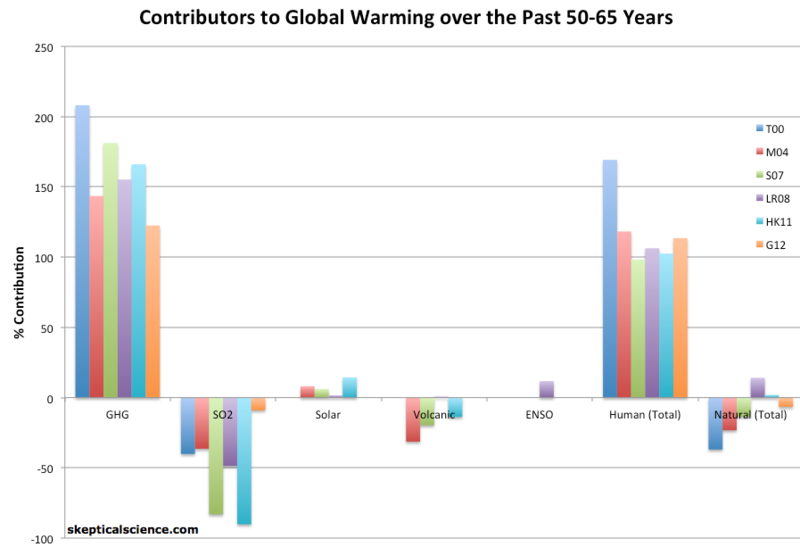 97% of these that attributed a cause, indicated that humans have caused most (50% or more) of the warming. Less than 3% indicated otherwise. The other 8,000 papers don't overtly attribute a cause. It's such a well known fact and self-evident. Just as most of you don't explain every day that it's the earth's rotation that causes the sun to come up every morning, as if it's a surprise, most scientists don't repeat obvious facts in every paper they prepare. In reality, we're probably causing more than 100% of the warming, which is offset to some extent by aerosols. Are deniers part of the 97%? Brandon Shollenberger is trying to imply that Cook et al 97% included abstracts that suggest it's just a little bit of warming that we're causing. That's a lie. He's building on recent statements by some of the denialiati that they are part of the 97% who think humans cause at least some global warming. But unless those deniers accept that humans cause most (at least 50%) of global warming, then they are part of the 3% deniers not the 97%. All similar studies point to the same thing. It's not as if the Cook et al study came up with a different result. Every single study looking at the subject have found that around 97% of papers and/or scientists who research this topic agree that humans are now causing most of the global warming. It's only deniers (not scientists) like those who frequent WUWT who disagree. There's an unpublished study from last year, that only found 24 out of almost 14,000 papers on climate change rejected global warming. Deniers like Anthony Watts and Brandon Shollenberger specialise in disinformation and lies. In this article, Brandon doesn't concede that Cook et al is one of many that found the same thing. 1. They’ve always managed to say “humans cause global warming” with the implicit qualifier of “some” (that they knew nobody would pay attention to). No, Brandon - Cook et al did not restrict its qualification to "some amount". Their cut-off was at least 50% of global warming. Humans are causing not just some but most of the global warming and likely all of the global warming. And going by the studies and policy statements from professional scientific organisations, most scientists would agree with that. 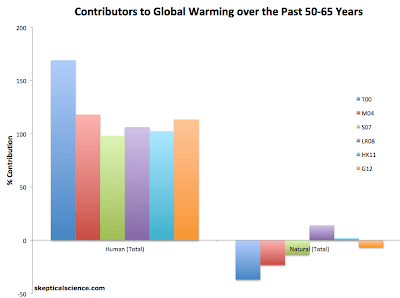 Here is a chart showing estimates of how much humans have contributed to global warming. Estimates range from more than 160% to just under 100%. The caption includes links to the relevant papers. Figure 1: Net human and natural percent contributions to the observed global surface warming over the past 50-65 years according to Tett et al. 2000 (T00, dark blue), Meehl et al. 2004 (M04, red), Stone et al. 2007 (S07, green), Lean and Rind 2008 (LR08, purple),Huber and Knutti 2011 (HK11, light blue), and Gillett et al. 2012 (G12, orange). . 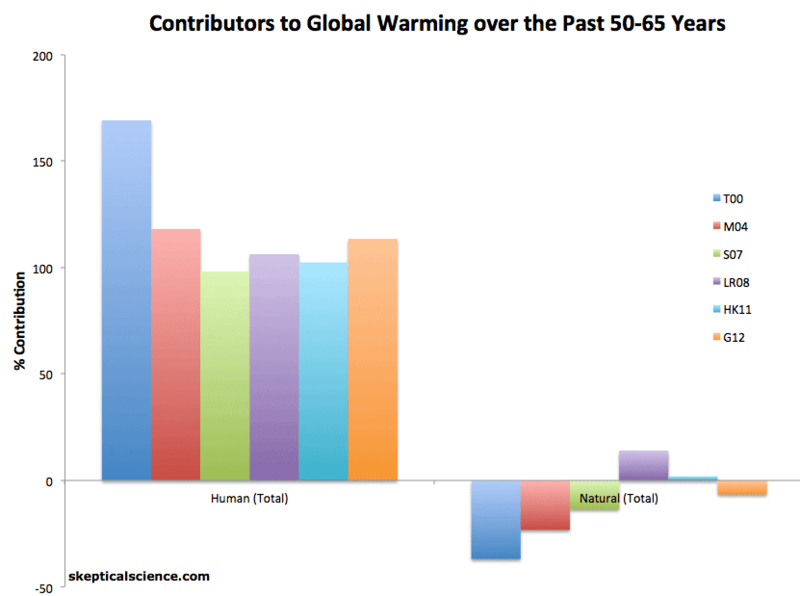 Humans are probably causing more than 100% of global warming these days. You'd have to be a complete idiot or a liar to try to argue otherwise. This blog has provided numerous examples of lying, disinforming and ridiculous claims made on WUWT. Anthony Watts' blog specialises in anti-science and disinformation - sometimes it's from Anthony himself and other times it's from people like Brandon Shollenberger. Don't trust WUWT or deniers. They lie. BTW Brandon is the one who got most upset with Professor Lewandowsky et al about the Recursive Fury paper, moaning that they got one of the conspiracy theories wrong - it was apparently another conspiracy theory. He's a bit weird all up. "The main source of sulphate aerosol is via SO2 emissions from fossil fuel burning (about 72%), with a small contribution from biomass burning (about 2%), while natural sources are from dimethyl sulphide emissions by marine phytoplankton (about 19%) and by SO2 emissions from volcanoes (about 7%). Estimates of global SO2 emissions range from 66.8 to 92.4 TgS/yr for anthropogenic emissions in the 1990s and from 91.7 to 125.5 TgS/yr for total emissions." There are other types of aerosols, but that rabbit hole is deep. These days human impacts on climate swamp changes in other forcings, such as solar and volcanic. As more anti-pollution measures take effect in developing countries, the impact of increasing greenhouse gases will show up even more than they have to date. How disturbing you have to troll people. My comment was "moved" to a forum where I cannot reply because "Sou" is lying and knows it. He claims to have truth on his side but is too gutless to debate an absolute amateur like me. That should tell you an awful lot. "He", "his"?!!! Tells me more than you can work out about you, Sam. By the way, just like every contrarian, denier, sky dragon, fake sceptic or whatever, you are free to repeat the Cook study and falsify its results. You are free to design your own study and publish it for the world to pick holes in and see how it stands. Since many have tried and none have succeeded in showing how Cook13 is false, perhaps you will be the one. Perhaps you know where the Tol 300 are hidden. But the debate you want is a sterile one since it has been done and Cook13 still stands. By the way, absolute amateur is a good description. People like you with an ideologically distorted view of the world cannot be debated. It would be evidence provided by us, followed by "no you are wrong" without any evidence as a rebuttal from you. Not debating you is not a matter of Sou being gutless, but rather the realization that it is useless.